If you have two VMs which are co-resident on a Xen machine then the Xenstore will play a pivotal role for the inter-VM communication. To confirm that your VMs are indeed co-resident, a simple “ping-pong” through the Xenstore is a fast verification method. It can even be done using the Xenstore tools without using the API. To find out your domain id, xenstore-read domid will read from the the domid field in your part of the Xenstore. Your part of the Xenstore is normally under /local/domain/<your domain id>/ in the Xenstore tree, and it is not possible to read the subtrees of co-resident VMs. Then you have shared read and write access (b<ID> is both) with all other VMs not explicitly listed. The next step is then simply to write a string there using xenstore-write and reading it using xenstore-read in the second VM. Moreover, I have used the world-readable data field extensively for creating a passtrough-encryption virtual block device. It is in the cloud providers interest that the cloud computing resources appear homogenous to the cloud consumers. When only looking at the Xenstore, to a certain degree this is true. It is not possible to list the /local/domain directory in the Xenstore to see which other VMs are running. Since this relates to the Xenstore daemon running in domain 0, the Xen hypervisor version as listed here should in principle be unrelated. However, the experiments in the field showed a 100% correlation of this bug exclusively to these two versions, and can thus be found to relate to how Amazon has packed their Xen packages together with their customizations. Some results that could be found using this bug are as follows. This plot shows who my neighbors were and how many disks they were using. 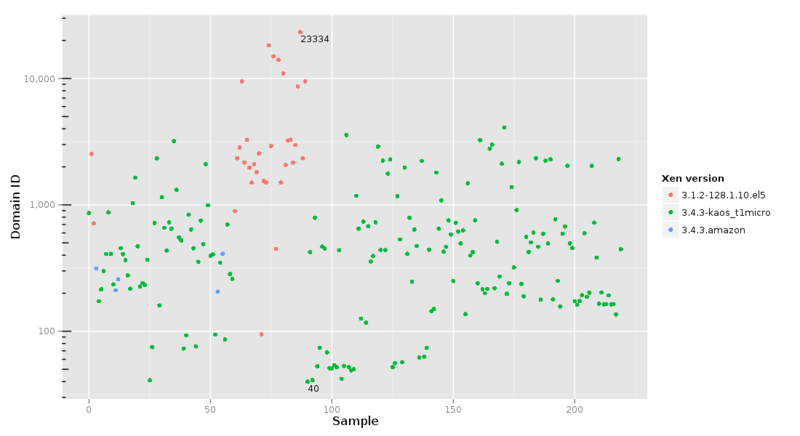 Furthermore, this plot shows that there are typically 24 micro instances per physical machine in EC2. These plots belong to a sample size of 26 instances where the leak was applicable. 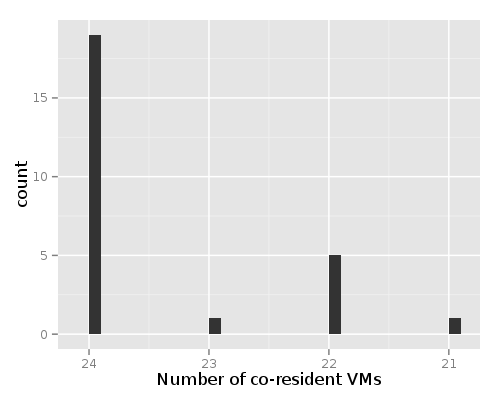 The number of co-resident VMs is a snapshot from the moment of deployment. During my master’s thesis I experimented with co-residence of virtual machines on the public cloud (Amazon EC2). The goal was to create a setting with co-resident VMs in which one VM offers specialized security services to another co-resident VM. Doing this in the public cloud was not academically very relevant, but a fun experiment nonetheless. Mapping the cloud has already been done before (see Ristenpart et al.) and that Amazon leaks some information has been pointed out before. Nonetheless, there is still much more to be discovered. Achieving co-residence is (of course) not endorsed by the cloud provider (in this case Amazon). 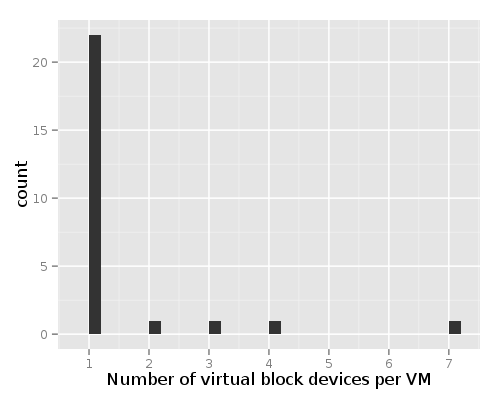 The chance that two random VMs are co-resident in the cloud is very small, since the cloud consists of a huge number of physical hosts. However, if you launch n=20 VMs in a single burst (via the AWS API), there is a non-insignificant chance that at least two VMs of these are started on the same physical host. Detecting co-residence can be done in multiple ways. For example by looking at the first hop (cf. Ristenpart et al.) or by exchanging “ping-pong” data through the Xenstore. A simple indication can be given by simply looking at the domain ID that your VMs have received. If these are sequential, then you have a good indication that these VMs might be co-resident. During my experiments I recorded information on all the VMs which were launched in order to get co-resident VMs. The following figure gives an overview of the domain IDs that my VMs received. This graph conveys that the domain IDs can vary quite a lot. Also shown is the Xen hypervisor version that was running on the respective hosts. I encountered at least three distinct versions of Xen hypervisors in the US East region. This information is exposed by Xen via the xen_version hypercall. From this information, we can infer a few observations. The variety in versions that are used seems to indicate that Amazon does not have an automated hypervisor updating scheme. This immediately raises the concern whether Amazon can patch running hypervisors against publicized vulnerabilities. It seems more likely that, unless they hotpatch their hypervisors, Amazon is running (vulnerable) outdated hypervisors on some of their machines. The version listed in the first column (3.1.2) lists its timestamps in South African timezones. This is a clear correlation with the fact that Amazon EC2 has its roots in South Africa. It has been noted before that Amazon is likely using Red Hat, and the above table shows (in the GCC strings) that the Xen packages are compiled on a Red Hat machine. Mockbuild (listed in column two) is a Red Hat tool typically used for building RPMs, giving additional indication that Dom0 must be running a Red Hat based Linux, too. In the third column we see a misleading compilation timestamp (3.4 was not out yet in 2006). All the compilation metadata for this version seems to indicate that Amazon is using a custom compilation toolchain now. Up next: learning more from the hypervisor and the Xenstore. These 220 measurements were taken throughout November 2012 on Amazon EC2 US-East region. All instances were micro instances. Drawing nodes in TikZ above each other can be tricky. For example, if you want to draw several nodes above another node in an aligned way. One way to achieve this is as follows. 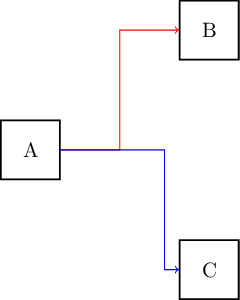 In this way, the left border of A and the right border of B do not extend beyond the basis node. 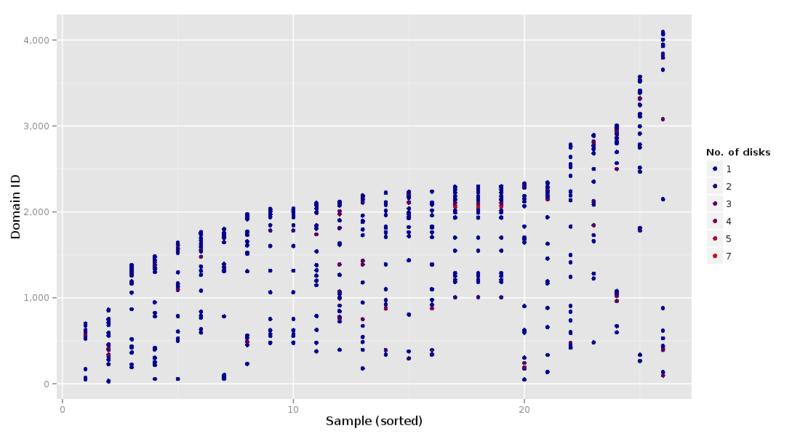 Note that you need to have the positioning TikZ libary loaded. In the series of TikZ tips, today we look at connectors between nodes. TikZ comes with a variety of line types between nodes, such as straight, curved, and right-angled. In particular the last one, right-angled lines, can be very useful in diagrams. Right-angled lines are usually more appealing than direct point-to-point straight lines in diagrams. Placing right-angled lines in diagrams in a visually appealing way is not always easy, however. 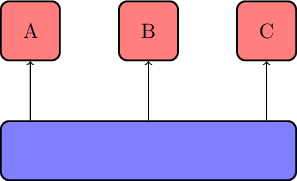 Consider for example this diagram in which a chain of nodes have an outgoing arrow into an array. In this figure, the line marked B is well-suited for a right-angled line. On the other hand, the line marked with A is less-suited, since it needs two bends. For the ease of use, try using the following two macros for horizontal or vertical lines. Note that you need to have the calc TikZ libary loaded.